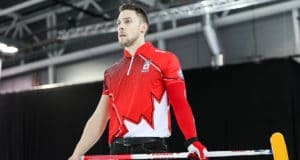 The Swiss skip picked up his sixth international bronze medal as Switzerland defeated Japan, skipped by Yuta Matsumura, 8-4 to claim third place at the 2019 Pioneer Hi-Bred World Men’s Curling Championship, presented by Service Experts, Heating, Air Conditioning and Plumbing on Sunday at the ENMAX Centre. It was de Cruz’s third world championship bronze to go along with two he’s won at the European championships and the one from last year’s Olympics when Switzerland beat Canada in the bronze-medal game. “Kind of sick of bronze medals, but we’re still happy,” said de Cruz, who was backed by fourth/vice-skip Benoît Schwarz, third Sven Michel, lead Valentin Tanner, alternate Claudio Pätz and coach Thomas Lips. Matsumura, third Tetsuro Shimizu, second Yasumasa Tanida, lead/vice-skip Shinya Abe, alternate Kosuke Alta and coach Bob Ursel, were trying to become first Asian team to collect a medal at the world championships. They looked on their way to doing so, dominating the first six ends. But the game turned in the seventh end when Schwarz made a raise takeout that scored four for a 6-4 lead. Miss it, and it’s a steal and a 5-2 deficit. It made a huge difference. Japan, however, looked to be getting even, or possibly take the lead, in the eighth but a sweet hit and roll by Schwarz on his final stone left Switzerland lying two behind cover. Matsumura tried to dial long distance on an angle raise of a guard but only got rid of one and gave up a steal to trail 7-4. With his final shot in the ninth, Matsumura tried a high-velocity triple and almost made it but one Swiss rock didn’t roll far enough and Japan gave up a steal, prompting them to shake hands with Switzerland ahead 8-4. “I almost feel a bit bad for the Japanese because they played such a good game. They had one bad end and everything changes,” said de Cruz, who thought his own team’s slow start Sunday had a lot to do with losing in an extra end to Canada in a semifinal Saturday night. Ursel, who is from Vernon, B.C., said the team was disappointed the Japanese were unable to win the country’s first world men’s championship medal. “They played so good, even that game. I mean, Yuta (Matsumura), he threw everything perfect. A couple of mistakes on strategy cost us, but what an awesome week for the boys. I couldn’t be prouder,” said Ursel. Canada’s Kevin Koe will play defending champion Sweden, skipped by Niklas Edin, in the 2019 Pioneer Hi-Bred World Men’s Curling Championship gold-medal game at 5 p.m. MT. TSN 1, 3 and 4, and RDS2 will provide coverage. Edin is appearing in his third consecutive final and is looking to tie a record with his fourth title while Koe is looking to win his third, but first on Canadian soil. 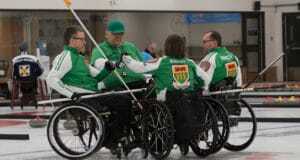 Live scoring, standings and statistics for the 2019 Pioneer Hi-Bred World Men’s Curling Championship are available at wmcc2019.worldcurling.org.